Oct 2007 - John Hill 48: The class of 48 did not materialise this year as I had hoped. Pete South, Brian Easy, Terry Stevens and Ron Sallis didn't make it though they had hoped to and Robin Baumber was ill. This is us at the last big reunion we had in 1987 when we were 50. 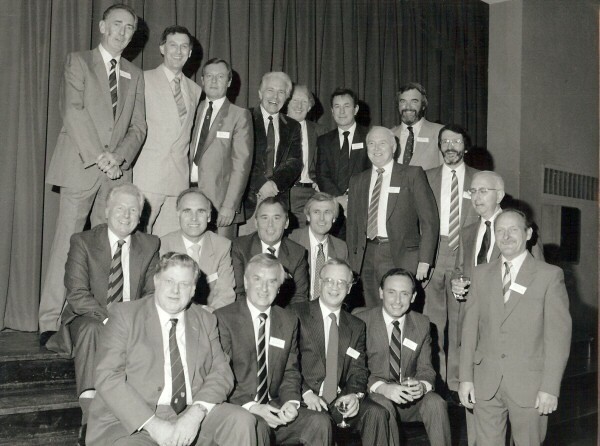 Back row: Peter Blanchflower (Burwell), David Engledow (Soham), Ray Bishop (Snailwell), Cedric Fretwell (Stuntney), Pete South (Littleport), Robin Baumber (Littleport), Mike Delanoy (Ely). Middle row: Ian Hobbs (Soham), Rodney Brown (Burwell), John Hill (Newmarket), Don Sykes (Mepal), Brian Easy (Littleport), Bert Nash (Isleham). Front row: (Brian Leonard 49, Guest speaker), Terry Stevens (Littleport), Billy Peters (Ely), Don Phillips (Little Downham), Brian Pullen (Ely), and Fred Thurling (Littleport).